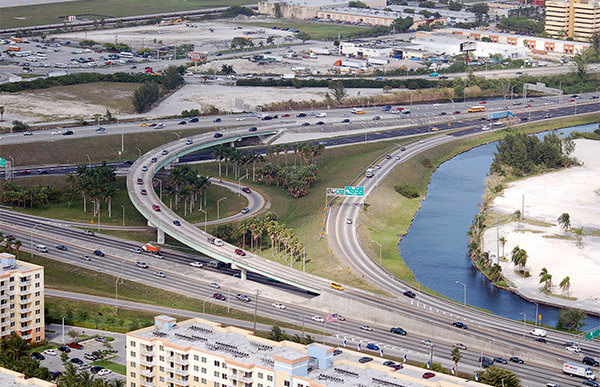 RS&H served as the lead design consultant to contractor MCM Corporation in the design-build widening of Dolphin Expressway in Miami, Florida. The roadway was widened to add an eastbound auxiliary lane from west of NW 57th Avenue to NW 42nd Avenue. The primary objective was to increase capacity to the eastbound lanes by providing a continuous four-lane section from SR 826 (Palmetto Expressway) to NW 42nd Avenue. Outside widening of the existing roadway. Outside widening of the existing bridges over NW 57th Avenue and the Tamiami Canal. Widening and reconstruction of the NW 57th Avenue and NW 45th Avenue ramp terminals. Construction of retaining wall systems. Relocation and replacement of signs, lighting, utilities, and ITS infrastructure. These improvements optimize mobility along the corridor by maximizing capacity, improving level of service, minimizing congestion, and enhancing safety. RS&H, with the support its various subconsultants, was responsible for the coordination and production of quality biddable construction documents that were used by the contractor to bid and construct the project. During construction, RS&H worked directly with the contractor to keep the project on schedule and budget.